Survival action game in which we find ourselves on a volcanic island controlled by robots. At Volcanoids, our command centre is the Drillship, a huge machine that is a mobile base, as well as a self-propelled mine and factory. 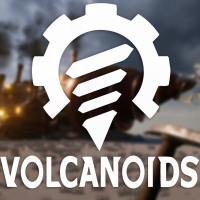 Volcanoids is a survival action game set in a steampunk universe. The production was developed by an independent Czech studio Volcanoid. Volcanoids takes players to a lonely island that used to be a real paradise. The eruptions of volcanoes caused by mechanical creatures have made most of its surface inhospitable wilderness. Players take on the role of a daredevil who decides to return to his former homeland and tear it out of the robots piece by piece. However, before he does so, he is facing a real struggle to survive in a world full of dangers. In Volcanoids the action was shown from the first person perspective (FPP). The production gives us the vast world, which consists of plains overgrown with lush vegetation, ash-covered uplands and lava-filled underground. When exploring you should be on your guard - the danger is not only the work on the island, but also the volcanoes, the explosions of which regularly shake this patch of land. The main character is not defenceless and his first prey is the Drillship, a powerful machine equipped with giant drill bits, which is his mobile base and at the same time a self-propelled mine and factory. Although we don't control it directly while playing, we can set a target (located on or below the surface) to which it should move. We use the raw materials obtained with its help to manufacture both tools and weapons for the protagonist (such as pickaxes, French keys or firearms), as well as additional modules increasing its combat and production capabilities. They are useful when crossing the island and attacking enemy bases and when defending our command center against enemies. Upon debut in Early Access on the Steam platform Volcanoids allowed only solo play. One of the main goals of the creators, however, was to enrich the project with a cooperation module and multiplayer mode based on PvP principles. Three-dimensional graphics of the game Volcanoids presents high quality. You may like the detailed, rich in vegetation environment and full of details models (with the Drillship at the forefront). Expectations: 8.5 / 10 calculated out of 2 players' votes.